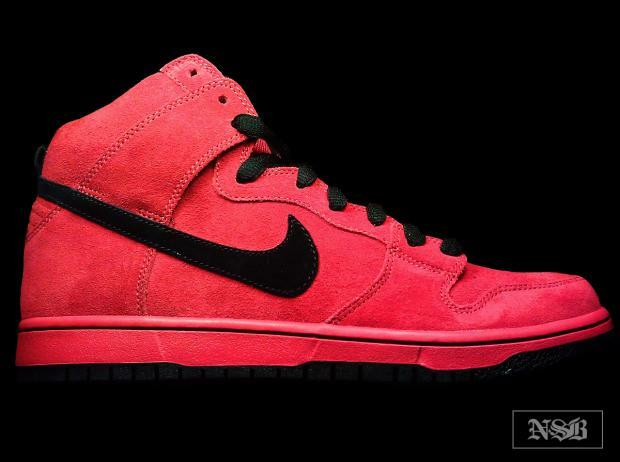 Nike SB pays tribute to the 'True Reds' with this Fall '11 SB Dunk High Pro. By now, most of us would agree that Nike SB will be paying homage to their early days in 2011. Originally released as a SB Dunk Low in a combination of leather and nubuck, Fall '11 will see the 'true reds' release in a suede SB Dunk High Pro. Honoring one of the most popular SB Dunk Low's of it's time, this 2011 high is almost guaranteed to be just as popular. Keeping up with the same colorblocking, they go to work with an all suede upper that's covered in true red, while the Swoosh arrives to us in black. The sole also arrives just as it did in 2003, with the midsole making use of true red and the outsole being covered in black. The 'True Red' SB Dunk High Pro is set for release Fall 2011.